This week is Spring break at UI Chicago. While I’ll be spending most of it working, it does give me some downtime to reflect. We’ve come pretty far, dear reader, in these almost three years. I learned, you learned. We all laughed. My blog has become my infinite source of entertainment and an invaluable tool for synthesizing my knowledge. 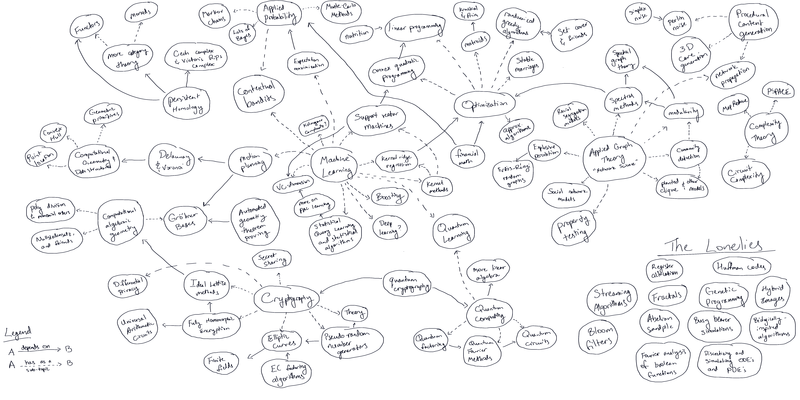 A map of most of my current plans for blog posts and series, and their relationships to one another. Click to enlarge. Now all you elliptic curve fanatics can rest assured I’ll continue working that series to completion before starting on any of these big projects. This map basically gives a rough picture of things I’ve read about, studied, and been interested in over the past two years that haven’t already made it onto this blog. Some of the nodes represent passed milestones in my intellectual career, while others represent topics yet to be fully understood. Note very few specific applications are listed here (e.g., what might I use SVM to classify? ), but I do have ideas for a lot of them. And note that these are very long term plans, some of which are likely never to come to fruition. So nows your chance to speak up. What do you want to read about? What do you think is missing? This entry was posted in General, Graph Theory and tagged mathematics, programming. Bookmark the permalink. This might be covered under one of the other bubbles, but I just recently managed to grok Binomial Distribution and the Inclusion Exclusion Principle. It took me about a month of semi-serious work (most waking moments that weren’t spent on the day job or the kid) to understand it. It’s also much simpler than it seems from the horrible documentation out there. Seems a good fit for the aim of this site. Not sure how many uses those have outside of my particular use though. Too narrow? Streaming algorithms! Bloom filters! Quantum learning! Spectral methods for sure. Any chance of manifold learning? So far any manifold learning stuff is deferred until after persistent homology. Looks really interesting, looking forward to the future! Jeremy, this is awesome stuff! Thanks for everything you have written, and i’m excited about what’s to come :). Some topics i’d be really interested in: 1) deep learning, restricted boltzmann machines and sparce autoencoders. 2) Bayesian networks, belief propagation, hierarchical models, variational bayes. And oh yeah, spectral methods :D.
Hi Jer, I’m interested in Procedural Content Generation, Biologically Inspired Algorithms, Fractals, and all your Crypto stuff (particularly Fully Homomorphic Encryption and Quantum Cryptography). Thanks! I’m looking forward many of the topics in the diagram, but some that I’m more interested in are matroids, Markov chains (and mixing times), Monte-Carlo methods, EC factoring algorithms, fractals and spectral methods. Thanks so much for your blog!! It’s been really cool!! Could you please do some posts on: Applied Graph Theory and Quantum Computing? Applied Probability also sounds really cool! !